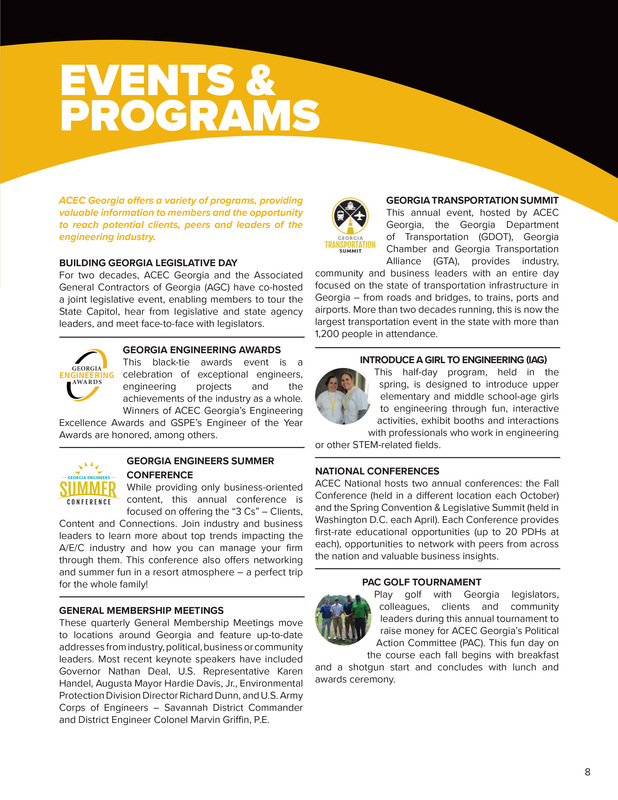 ACEC Georgia offers a variety of programs, providing valuable information to members and the opportunity to reach potential clients, peers and leaders of the engineering industry. BUILDING GEORGIA LEGISLATIVE DAY: For two decades, ACEC Georgia and the Associated General Contractors of Georgia (AGC) have co-hosted a joint legislative event, enabling members to tour the State Capitol, hear from legislative and state agency leaders and meet face-to-face with legislators. GEORGIA ENGINEERING AWARDS: This black-tie awards event is a celebration of exceptional engineers, engineering projects and the achievements of the industry as a whole. Winners of ACEC Georgia's Engineering Excellence Awards and GSPE's Engineer of the Year Awards are honored, among others. GEORGIA ENGINEERS SUMMER CONFERENCE: While providing only business-oriented content, this annual conference is focused on offering the "3 Cs" - Clients, Content and Connections. Join industry and business leaders to learn more about top trends impacting the A/E/C industry and how you can manage your firm through them. This conference also offers networking and summer fun in a resort atmosphere - a perfect trip for the whole family! GENERAL MEMBERSHIP MEETINGS: These quarterly General Membership Meetings move to locations around Georgia and feature up-to-date addresses from industry, political, business or community leaders. Most recent keynote speakers have included Governor Nathan Deal, U.S. Representative Karen Handel, Augusta Mayor Hardie Davis, Jr., Environmental Protection Division Director Richard Dunn and U.S. Army Corps of Engineers - Savannah District Commander Colonel Marvin Griffin, P.E. GEORGIA TRANSPORTATION SUMMIT: This annual event, hosted by ACEC Georgia, the Georgia Department of Transportation (GDOT), Georgia Chamber of Commerce and Georgia Transportation Alliance (GTA), provides industry, community and business leaders with an entire day focused on the state of transportation infrastructure in Georgia - from roads and bridges, to trains, ports and airports. More than two decades running, this is now the largest transportation event in the state with more than 1,200 people in attendance. INTRODUCE A GIRL TO ENGINEERING (IAG): This half-day program, held in the spring, is designed to introduce upper elementary and middle school-age girls to engineering through fun, interactive activities, exhibit booths and interactions with professionals who work in engineering or other STEM-related fields. NATIONAL CONFERENCES: ACEC National hosts two annual conferences - the Fall Conference (held in a different location each October) and the Spring Convention & Legislative Summit (held in Washington, D.C. each April). Each conference provides first-rate educational opportunities (up to 20 PDHs at each), opportunities to network with peers from across the nation and valuable business insights. PAC GOLF TOURNAMENT: Play golf with Georgia legislators, colleagues, clients and community leaders during this annual tournament to raise money for ACEC Georgia's Political Action Committee (PAC). This fun day on the course each fall begins with breakfast and a shotgun start and concludes with lunch and awards ceremony.